See and experience your world in a whole new light. 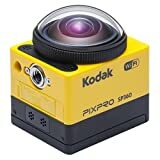 Introducing the KODAK PIXPRO SP360 Action Camera designed not only to capture what you love to do, but much more of it! Immerse yourself and record 360º of HD video without the need for multiple cameras. KODAK PIXPRO Digital Cameras. This entry was posted in Discount Photography and tagged Action, Camera, Extreme, Kodak, Pixpro, SP360 Extreme, Yellow/Black by Ball Photo. Bookmark the permalink.